At its most basic level, you can think of an economizer as a “smart window” that automatically turns off the existing refrigeration system and opens a vent to the outside when it’s cold out. Ultimately this will save you vast amounts of energy and money since our system uses only a fraction of the energy used by a standard refrigeration system. Beyond just putting a whole in the wall, our proprietary design does much more to maintain your cooler’s temperature and keep your food product safe! 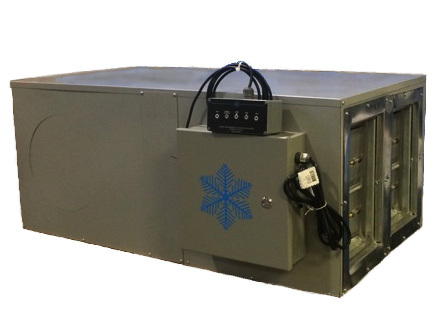 The Nordic Economizer automatically turns off your existing refrigeration system whenever the outside air temperature drops below a predetermined set-point, and uses a combination of low-energy motors, dampers and control boards to refrigerate your cooler entirely with outside air. Our computer controlled system mimics your pre-existing mechanical equipment. It delivers perfectly conditioned air at the right temperature and humidity to maintain food product quality… irrelevant of how cold it gets outside. No need to worry about over freezing sensitive food products like produce. All systems are equipped with two stage filtering and Merv13 filters to keep the majority of pollutants out of the cooler. Additional filtration is available upon request. At a glance, indicator lights mounted in the walk-in will let you know the system is operating properly, remind you to change the filter, alert you to any potential problems, and defaults back to the standard refrigeration system in the event of any failures. Have your local HVAC service company simply mount four insulated ducts, some low-voltage control wire, the indicator light box, and plug in the 120v power cord!